This is going to be a weird review. Well, mission half-accomplished! 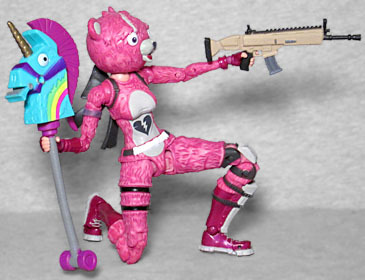 Fortnite is currently the most popular game in the most popular genre around, meaning that for once, McToys has released the right product at the right time. Fortnite is a knockoff of PlayerUnknown's Battlegrounds in much the same way that Team Fortress 2 is a knockoff of Counter-Strike: ie, it's the same basic playstyle, but one of them is drab and uninspired, and the other has cool ideas and zany character designs. We'll let Jim-googing-Sterling, son, explain it, so we can focus on the toy. Because this toy is... definitely something, all right. The first release in the line is an eye-catching, unique figure, almost 180° from the vastly generic Call of Duty soldiers that have been hitting stores in the past couple months. 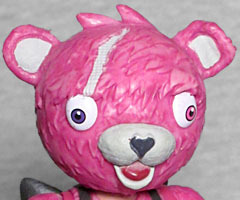 "Cuddle Team Leader" is a skin you can buy for your character to wear in the Battle Royale mode - it turns you into a cuddly pink teddy bear, like Kuma from Afro Samurai, except cute. It's even got the same slightly derpy eyes! One pupil is purple and the other is pink, and they point in different directions. Below the neck, the suit looks like a fuzzy set of pajamas, rather than a legit fursuit. It has a really nice sculpted fur pattern that's just on this side of cartoony, and there's a smooth patch on the belly with a Care Bearish broken heart symbol painted on. But to make it clear that this isn't just someone's "Netflix and chill" outfit, she's wearing some kind of electronic device strapped to her right forearm and has a bit of tactical armor tied to the left shin and a knee brace with a matching angular pad above that. There's a "scar" over the right eye (which is really just a bald stripe where the fur is gone, with an appropriate texture that you'll recognize if you've ever had a plush toy develop a bald spot). Paint is generally pretty reliable on a McFarlane toy, so let's talk about that next. Cuddles' pink is strong and vibrant and shows an impressive variance: it's light on the top, with darker shades under the sculpted egdes of the fur, making it look more animated. Her fingerless gloves and her sneaker-boots are a glossy cherry red. The soles of her shoes, the armor, the patch on her belly, the interior of her ears and the mask's snout are all a light gray, with true white reserved for her belt and eyes. 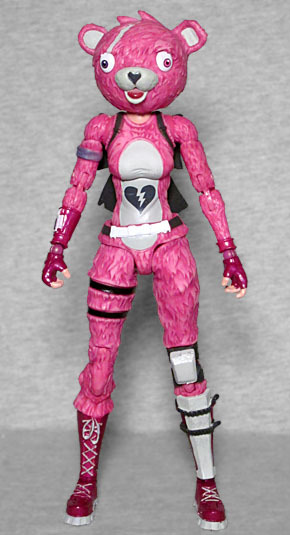 The straps on the figure are black, and there's a purple bandana tied around her right arm. There aren't a lot of accessories with this figure, despite the gigantic box she comes in. There's a Legendary variant of the go-to Assault Rifle (the one that looks like a tan FN SCAR), which she holds in her left hand because that's the one with the trigger finger extended. 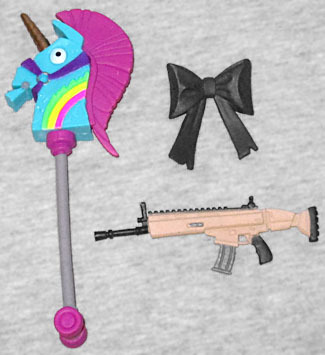 Then there's the Rainbow Smash Harvesting Tool, a weapon that can either be used for melee combat or to dig up resources; this one is designed to look like a blocky unicorn hobby horse, with blue skin and a rainbow on the neck, a purple mane, and a spiraled golden horn. Finally, there's the Cuddle Bow "back bling," Fortnite's goofyass name for a backpack. 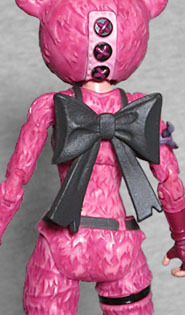 It's just a big dark grey bow that plugs into the toy's back (though if you turn her around to appreciate it, you can also bask in the three big buttons that look like they hold her mask closed). Finally, there's a black disc base to help her stand. And so now we must talk about the articulation. If there's one thing McFarlane Toys is known for, it's bad articulation. Even now, when they're trying to add more, it doesn't always work out great. 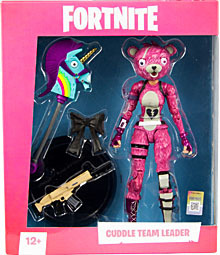 So we should probably keep our expections for the Cuddle Team Leader low, yes? Well... who are you and what have you done with the real McFarlane Toys? This figure has a balljointed head, balljointed and swivel/hinge shoulders, swivel biceps, double-hinged elbows, Revoltech-style swivel/hinge/swivel wrists, a balljointed chest, a balljointed waist, swivel/hinge hips, swivel thighs, double-hinged knees, Revoltech ankles, and hinged toes. This is amazing! Not only does she have a ton of movement, it's all designed to modern standards: no exposed pins, no visible ratchets, nothing that you think of when you think "McFarlane." Seriously, this is good. This is really good. Considering that Fortnite's biggest claim to fame is its dances, the fact that Todd has finally stepped up to the kind of quality we expect from NECA and other good companies truly matters. Somehow, Fortnite seems to be avoiding the kind of toxic assholes so many other games seem to attract or breed. Kids are playing it, but it's making them nicer and more physically active in real life. Plus, it doesn't have the kind of loot crate mechanic that other popular games (*cough cough Overwatch cough*) use to encourage children to gamble. So it seems the game is at least ethically "not evil," which is a step in the right direction? And the fact that the toy is so shockingly good is just icing on the cake. 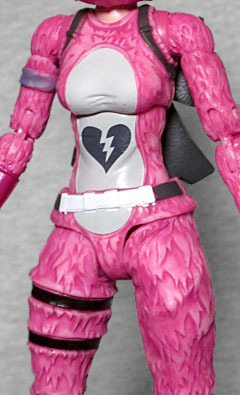 She has a great sculpt, great paint, is fun to play with... suddenly, we're looking forward to McFarlane product again.